Please allow extra time for engraved orders. Normal processing time is 2-3 weeks. 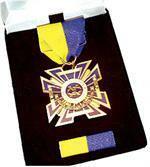 Includes a medallion suspended from a blue and gold ribbon and a military-type service ribbon that can be worn on a uniform, handsomely gift-boxed for presentation. 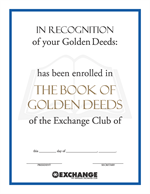 Six Sets of Golden Deeds Certificate & Photograph Page. 12” x 9” faux marble panel, brass metal inlay, engraving plate included (2 ¼” x 5”). 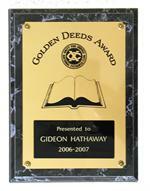 13 ½” x 14 ½” brass-plated open book with antiqued emblem on solid walnut panel, engraving plate included (3” x 11”). 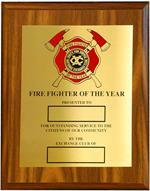 8” x 10” Walnut Finish Award to honor an outstanding Fire Fighter in your community, features red emblem. 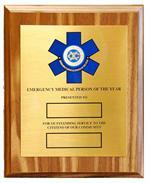 Heavy gold plated medallion suspended from blue and gold ribbon, red for Firefighter of the Year and blue for Law Enforcement Officer of the Year. Comes with uniform ribbon and handsomely gift boxed for presentation. 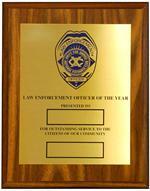 8” x 10” Walnut Finish Award to honor an outstand Law Enforcement Officer in your community, features blue emblem.